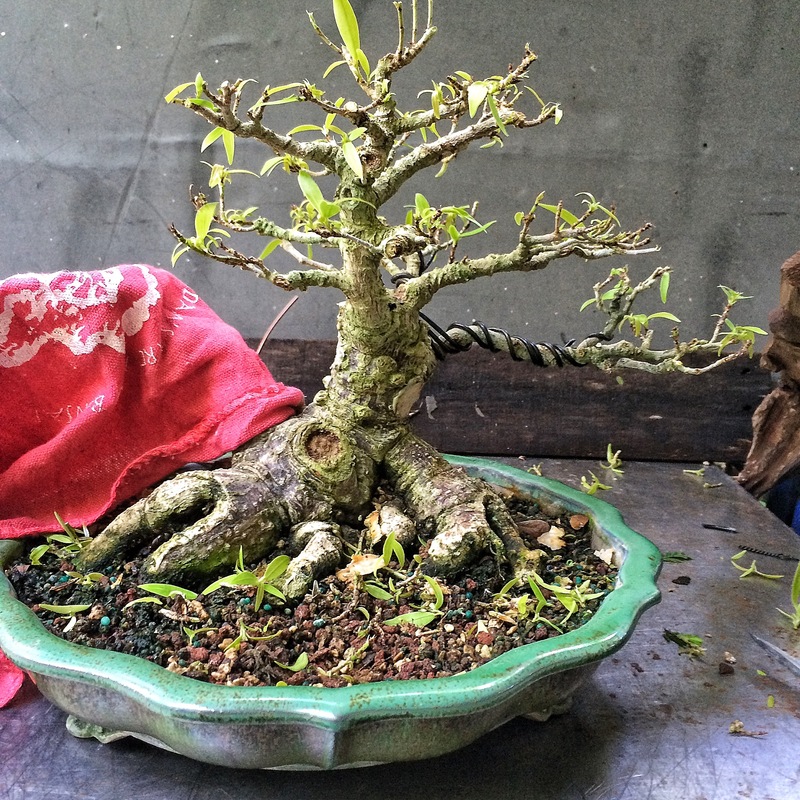 See, if you just wait ten years, you, too, can have a bonsai. When I got the tree, you could see through the trunk and those aerial roots. Not so much now. I hadn’t really looked at it closely until Jonathan pulled it out of the ground. Wait!? You don’t know Johnathan yet? He’s my new student, apprentice really. It’s so frustrating that I sometimes feel like Driving Miss Daisy (if you don’t know the reference, either look it up, or to hell with you). …ok, a lot tall. 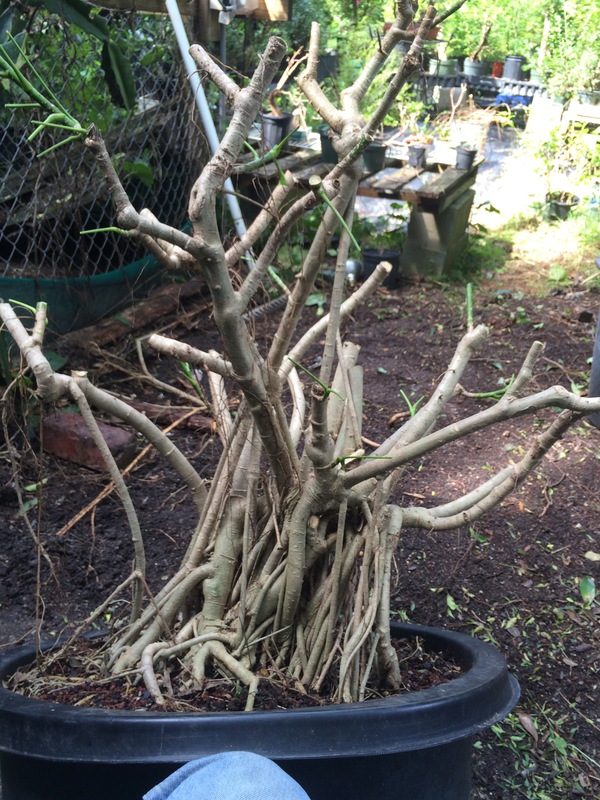 But the secret to growing a trunk is having enough leaves to feed it and, more importantly, let it get tall…. ….then you cut it back, then get tall again, and cut it back, etc. One could say that this growing and chopping is a bonsai technique but, you know what, they use the same technique growing Christmas trees too (I must admit, I have said, in the past, that the large scale commercial bonsai farms in Japan growing black pine bonsai are producing nothing more than Japanese Christmas trees. Imagine acres and acres of near identical pines, about 2 feet tall, with the first branch on the right and the corresponding bend in the trunk…..first branch, second branch, back branch HAI! It’s like they’re all dancing to the same tune-probably “Watch me (Whip/Nae Nae)” by Silentó. If you know the song you are laughing on the floor. The moyogi style looks just like the dance……….if you are brave, look up the video. I warn you, it’ll be stuck in your head all day). Anyway, this isn’t anywhere near a moyogi Japanese black pine. It’s more like a monster ficus, slowly devouring a hapless village over a thousand years. That’s a powerful tree. I think it’s a choppin’ time! I’m keeping it a little taller than I would, normally, to allow for dieback. 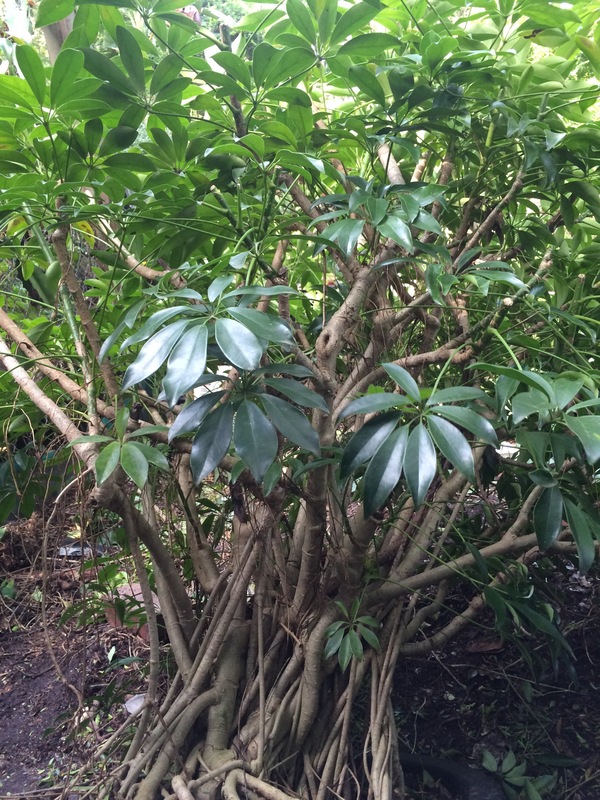 A schefflera is a very node specific plant, meaning that a new leaf or branch will only grow where there’s a visible node. 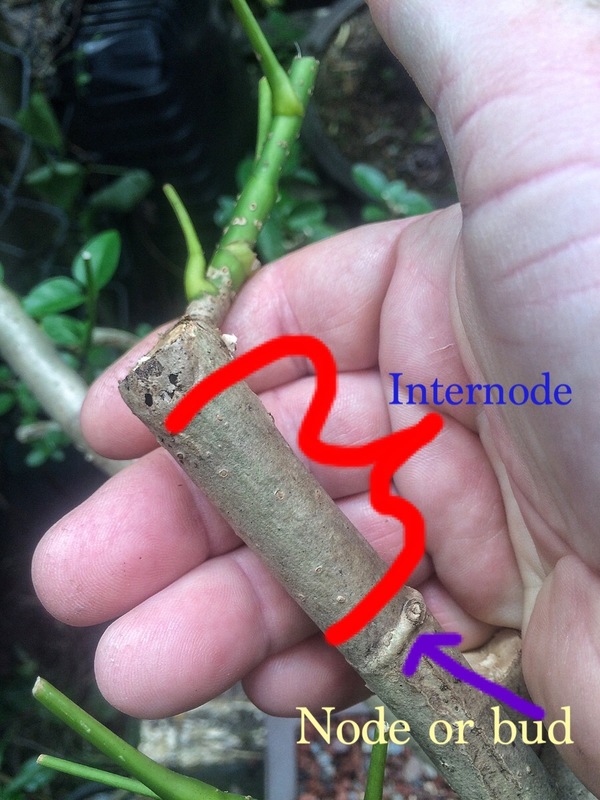 If I make a cut anywhere in the internodal area, the branch will just die back to the next node. It’s annoying but, if you are aware of it, it’s predictable. Next we pot it down. That’s right, into a smaller pot. 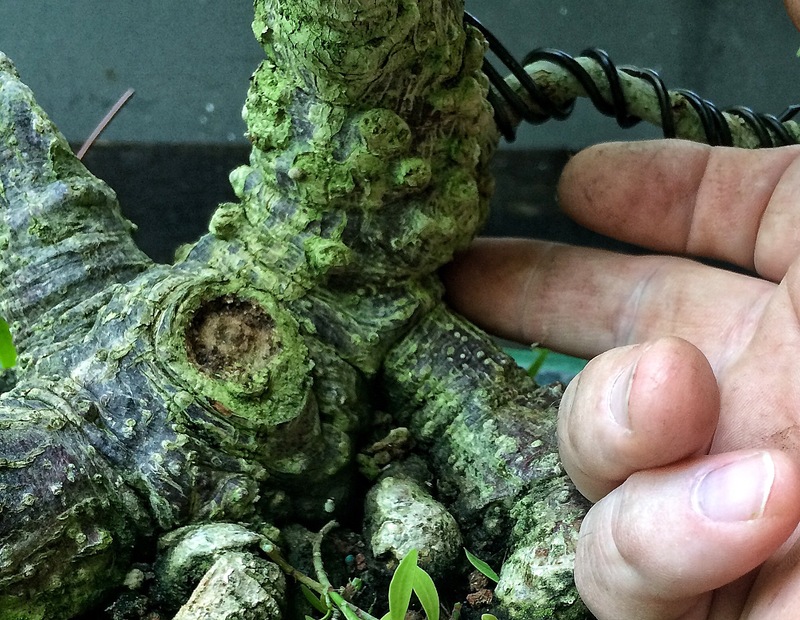 This will slow growth (maybe, this tree is a monster) and shorten those internodes a bit. Here’s the pot. To give you scale, the pot with Johnathan. 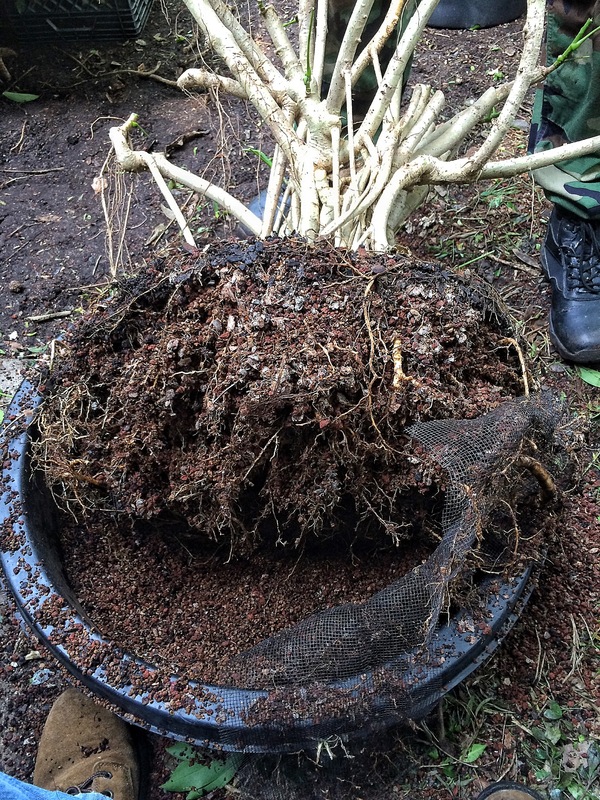 The pot seems big but, compared to the roots of the schefflera? 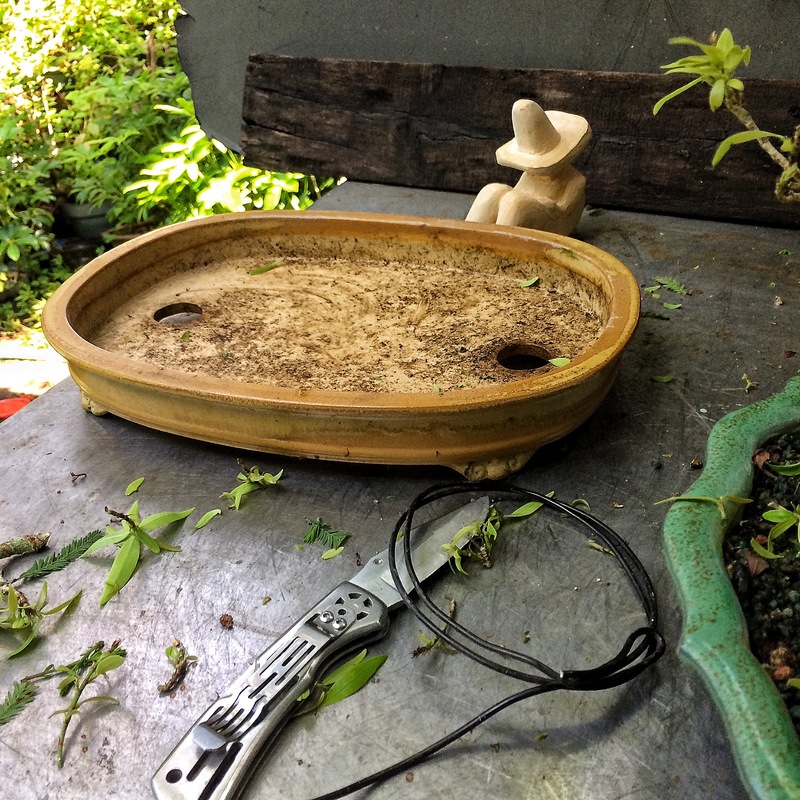 The big pot came from Judy, down in Ft. Myers, after a private carving session she hired me for. She was way too generous (I thank you very much, Judy! 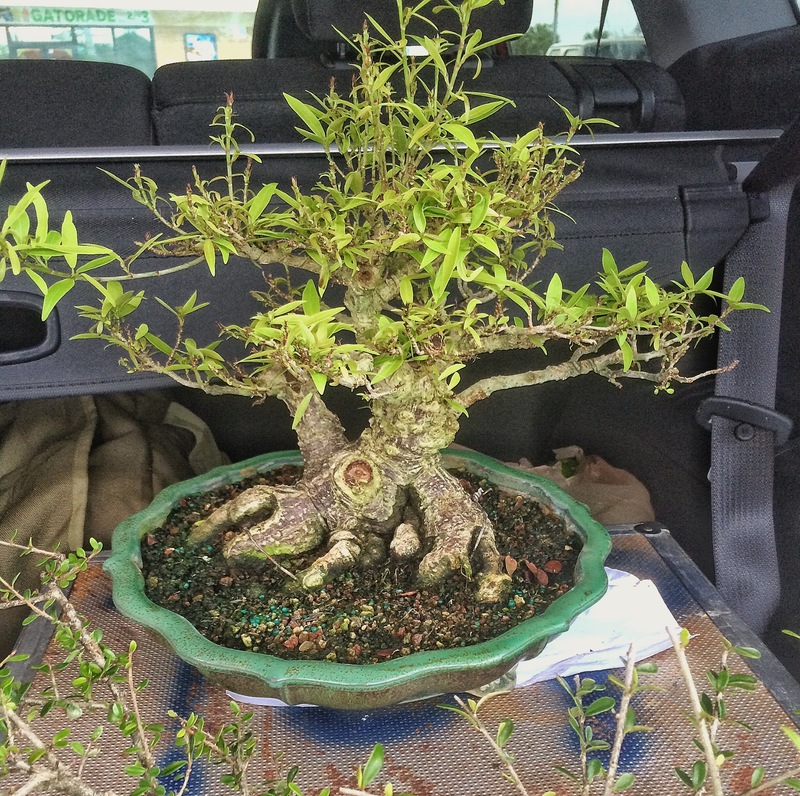 ), she even gave me this Willow leaf ficus. In a Japanese pot no doubt. 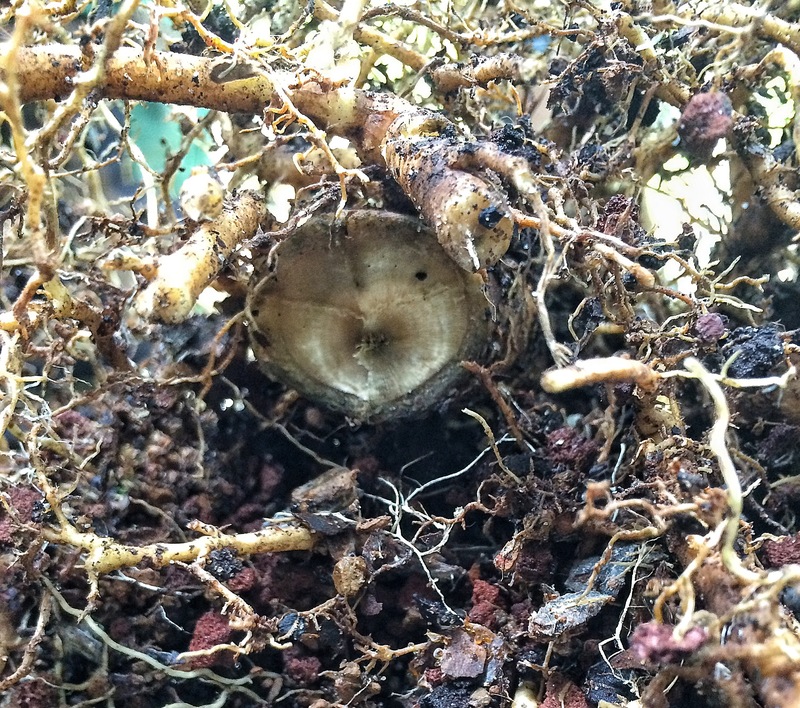 I was admiring the nebari, the root base…..
…..and she told me to take it. She really enjoys the posts I make on Facebook and said I had to post the development. 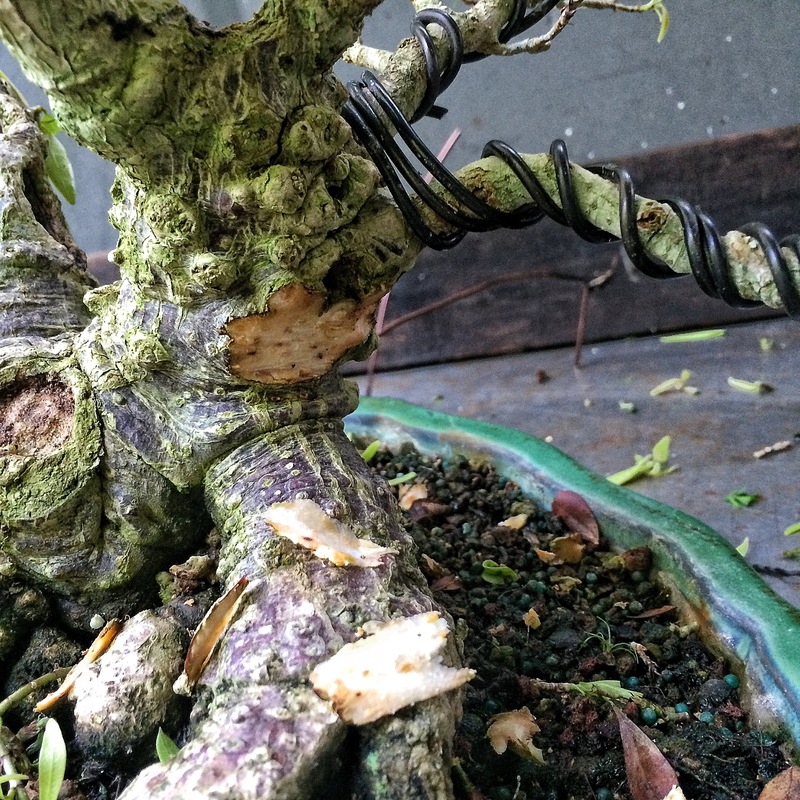 You can see where the root bifurcation technique was used to improve the nebari. There’s a bit of reverse taper from swollen buds. The Willow leaf doesn’t have a problem producing internodal growth. It’s a battle sometimes in stopping new buds from forming. Then I briefly contemplated removing the second trunk. I’ll keep it. But in a different pot. I could use some more wire but I’ll let it grow a bit more, then, the wire. It’ll be a nice tree in a year or so. 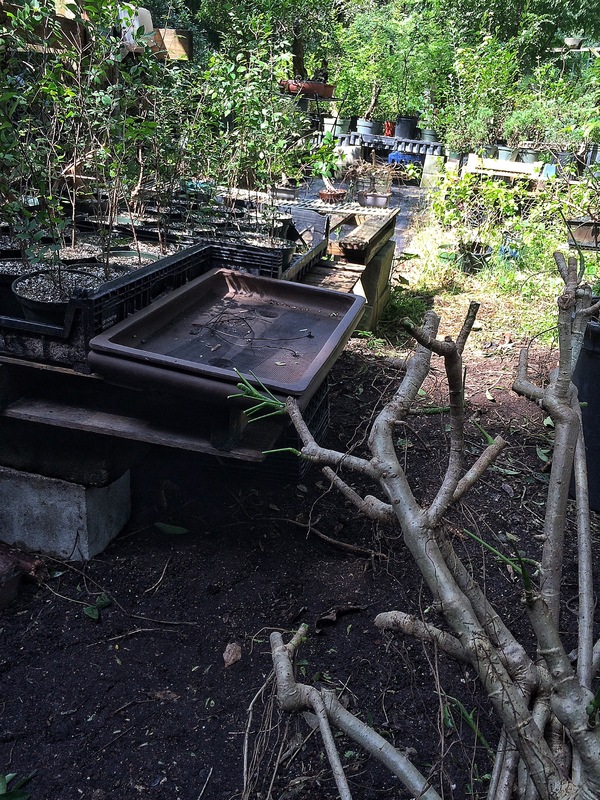 Thank you again Judy, for the tree and the big pot, which is coming in useful right about now…. What’s surprising to me is how loose the roots are. It’s been in that pot for ten years but it’s not a solid mass. If it were a ficu, it’d be a brick I’d have to take a pick-axe to. 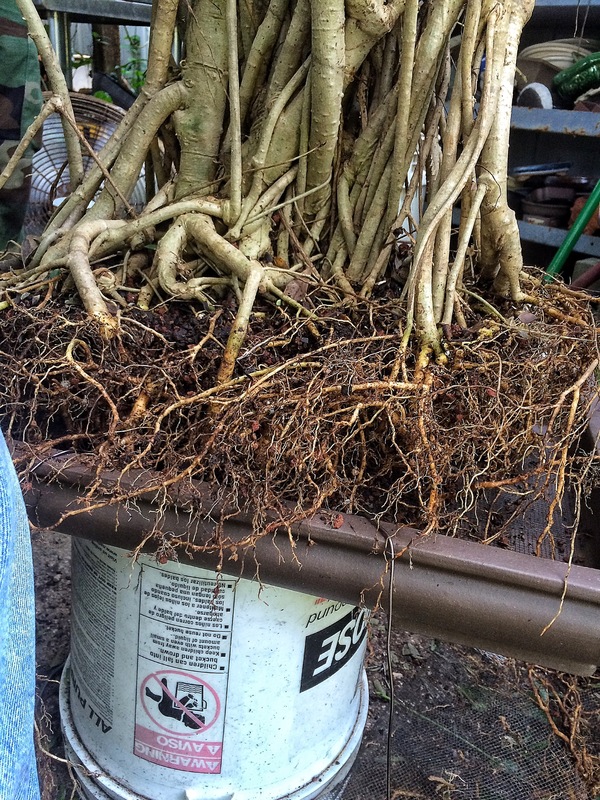 There are still too many roots and they’re too big for the chosen pot. Let’s get out the big boy tools. 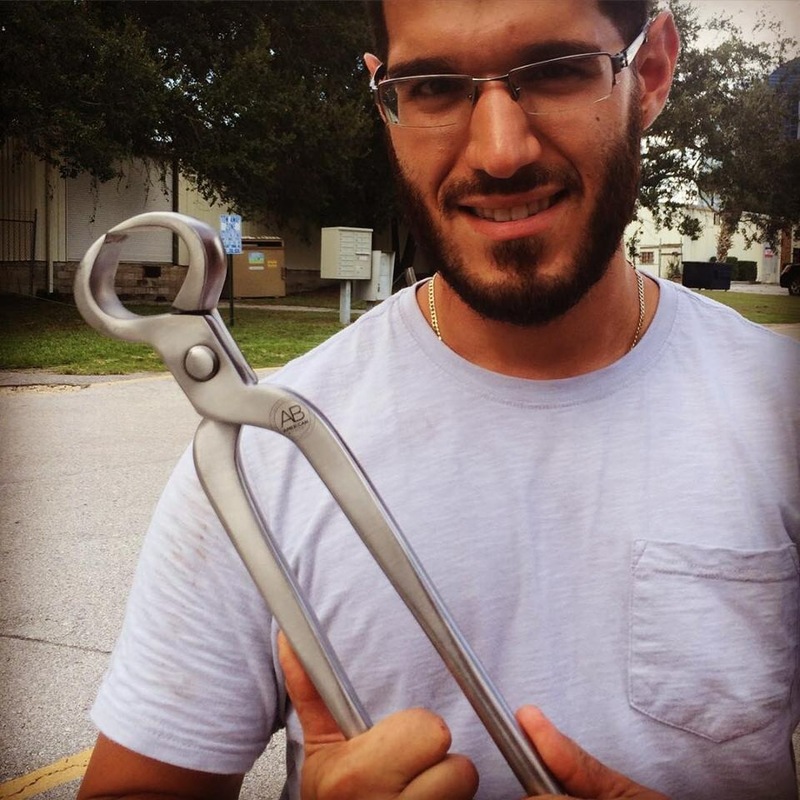 Where’s that 16 inch flush cutter? I’ve nicknamed it “The Amputator”. 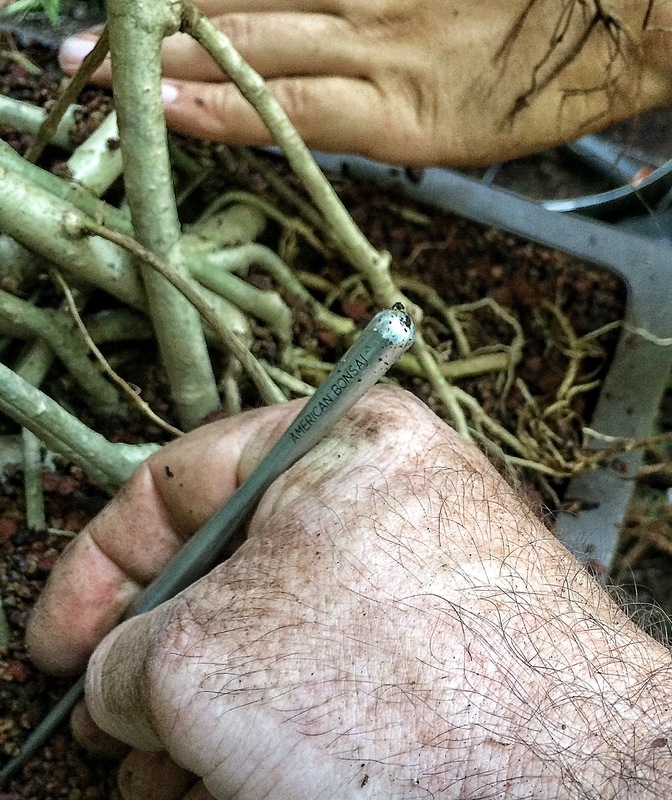 When cutting back tropical and deciduous trees for their first bonsai pot (and only if they’ve been strong growing and untouched for years) I always cut those downward growing roots as high up in the rootball as I can. 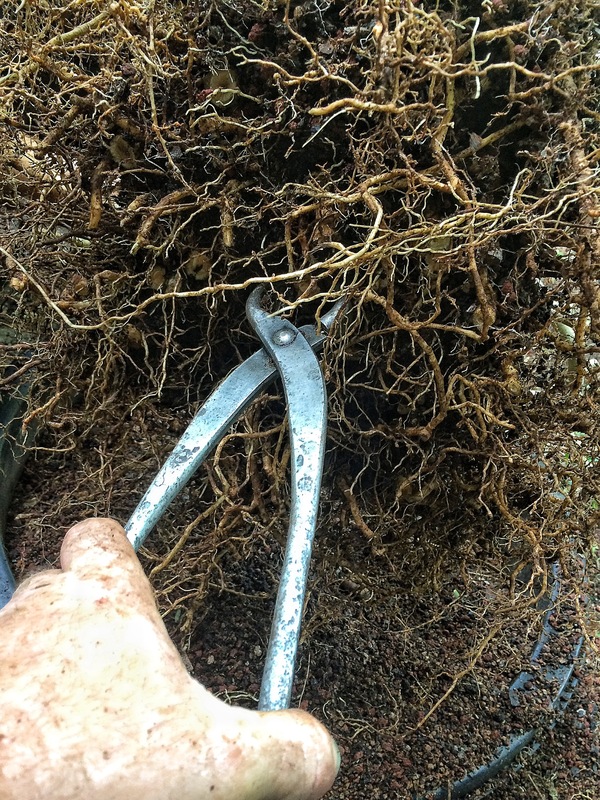 Even if I’m putting it into a deeper pot (unlike this operation) I’ll cut them as though they’re going into a shallow pot. 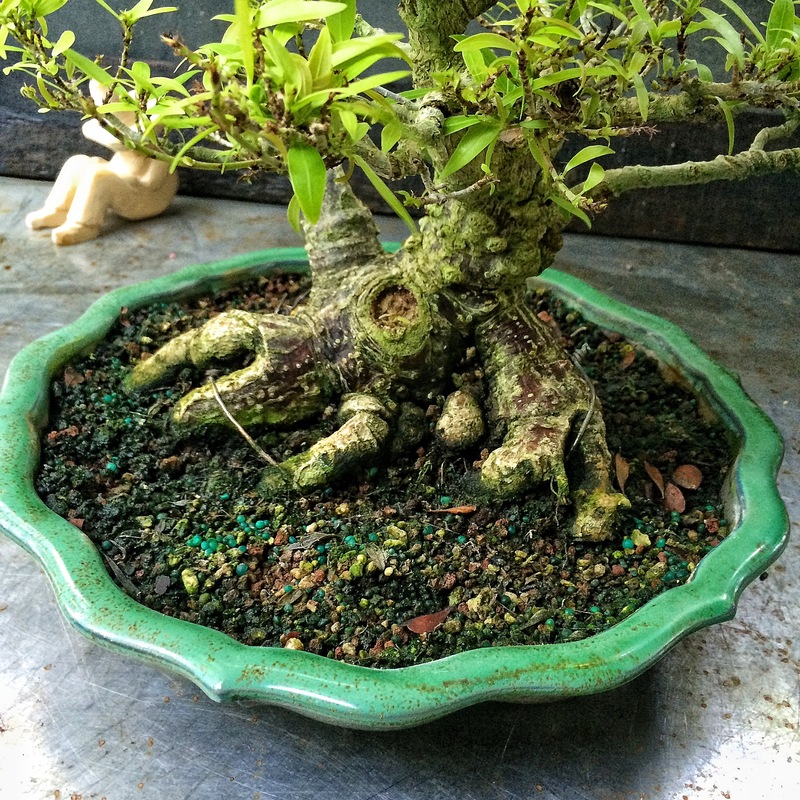 The reasoning is this: the tree, after all those years of strong growth, won’t have as much energy as it does now (when you begin growing a tree as a bonsai, it tends to weaken it to a degree) and gradually reducing the big roots (as many people teach) is like death by a thousand paper cuts. I should note that even though I am in Florida, I still should have done this root pruning last month, at the latest (it’s September now, so cross your fingers). Always do work in the correct season. I’m confident that the strength of this tree will get it through. But don’t you do it. Especially those of you in the Great White North. We manage to shoehorn the tree into its new home. 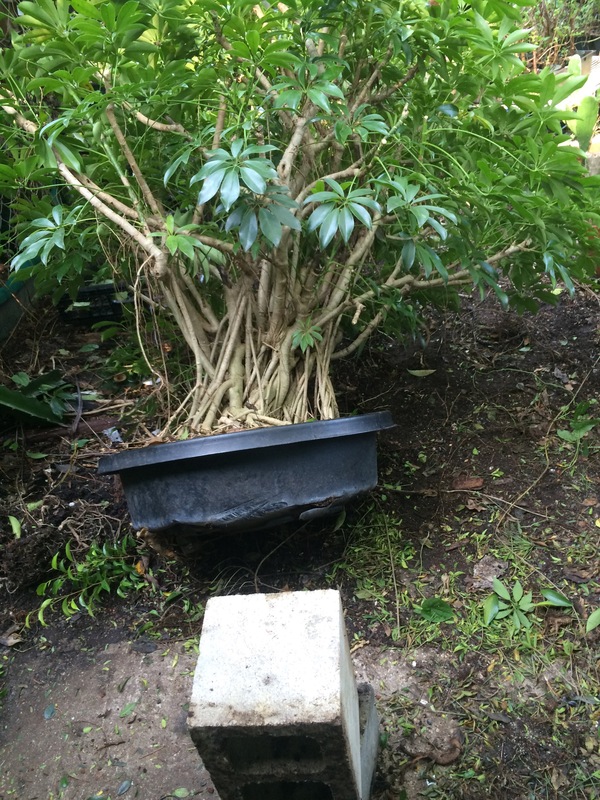 This will actually be my first real attempt at schefflera bonsai, so it’ll be a learning experience for us all. What do you think? Acceptable? Like I said, I left those branches long and even left more than I’ll use in the final design of the tree, but I think it’s a good start. And to those of you saying that I should have kept the tree in that bigger pot to speed development, nope. I want slower growth now. In that big pot I would get foot long shoots in weeks. I don’t want that. I want short internodes and increased ramification and the smaller leaves that that creates. 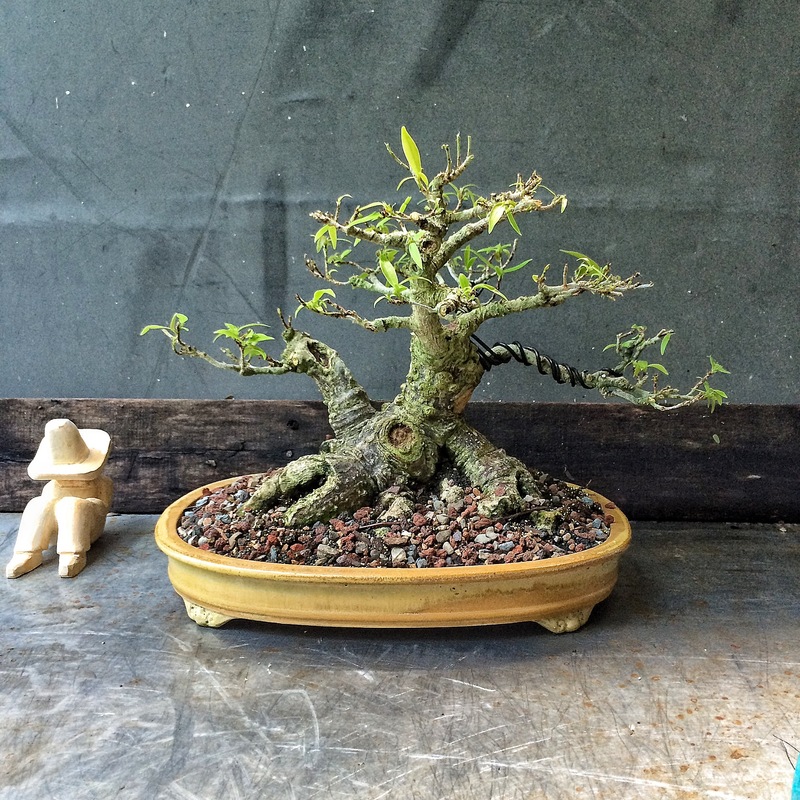 It’s time for bonsai techniques now. 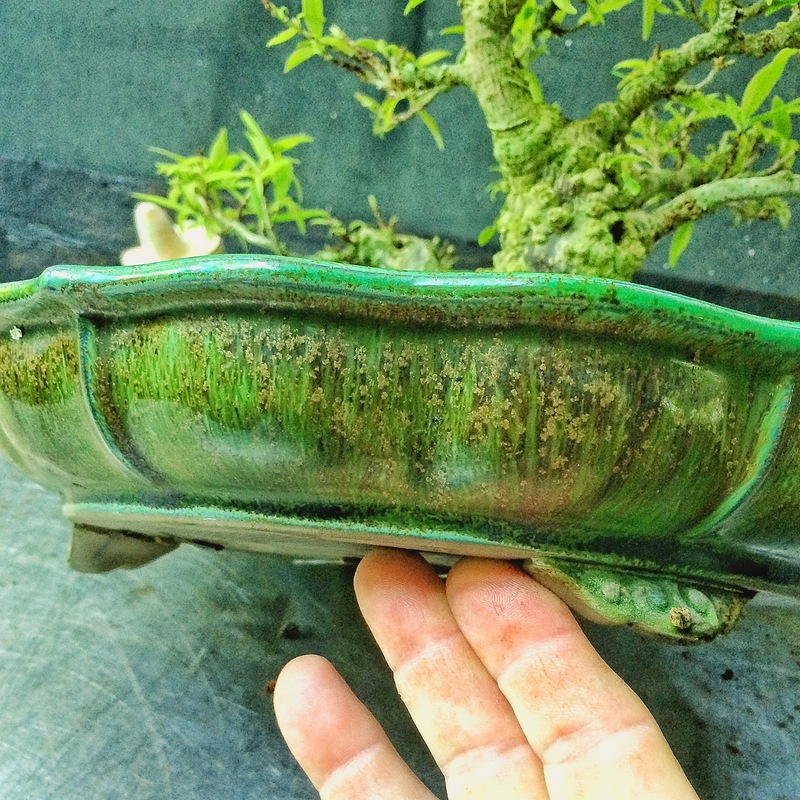 Prev There’s something not quite right here…..is it bonsai? Art? 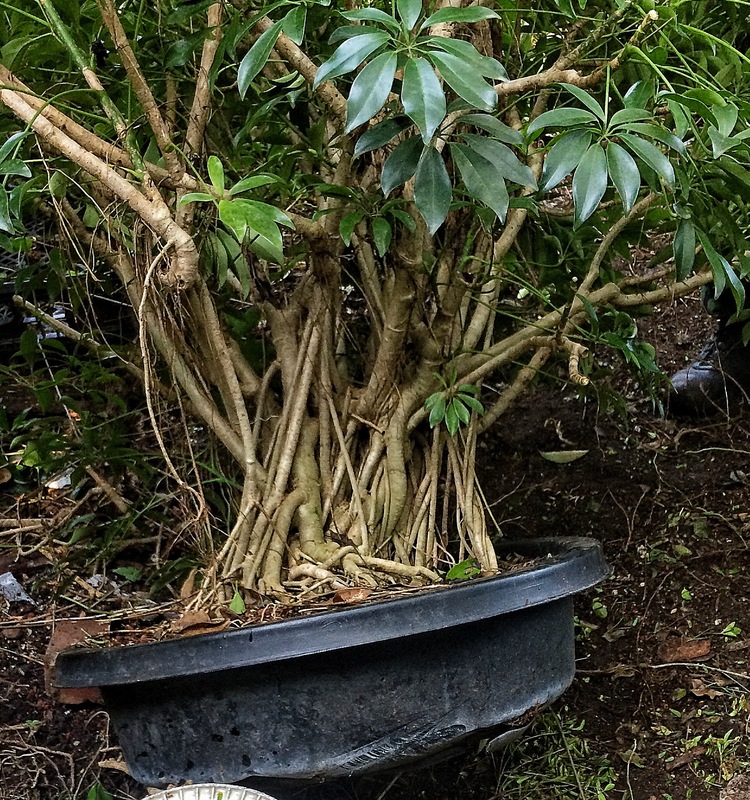 It seems that very few enjoy the Schefflera as bonsai, but I am a fan. I especially enjoy the “Luseane”. Fast growers, and very durable. I look forward to more progress from this one! On the willow leaf, the upper trunk you called buds. I have one and I posted pics on a forum and was told it was gall. Do buds look like gall? 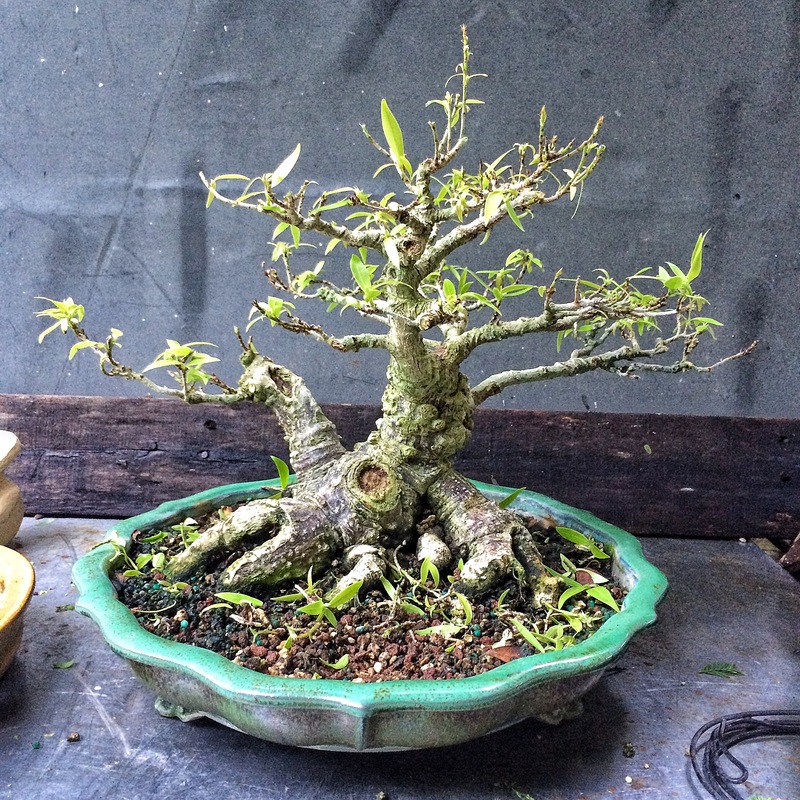 Whoever said that may not be familiar with the Willow leaf ficus. 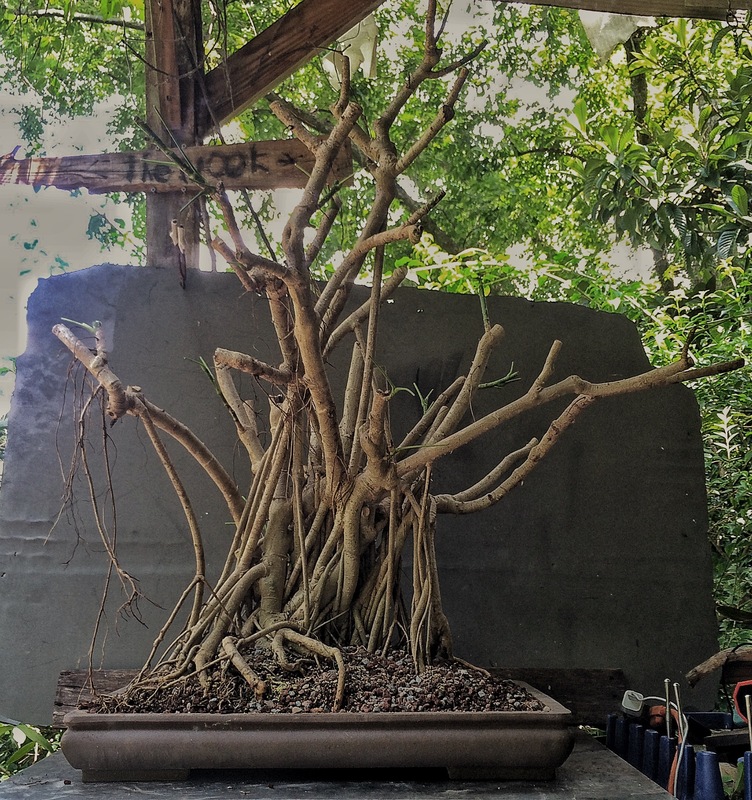 It has the most bud formation of any ficus. The way you deal with it is to let them all grow and then pick the strongest of them and remove all the rest. Hey Adam, I just acquired a large shefflera that is badly pot bound and is leggy. I’d like to cut it back some what hard and re pot but am not sure if I should. 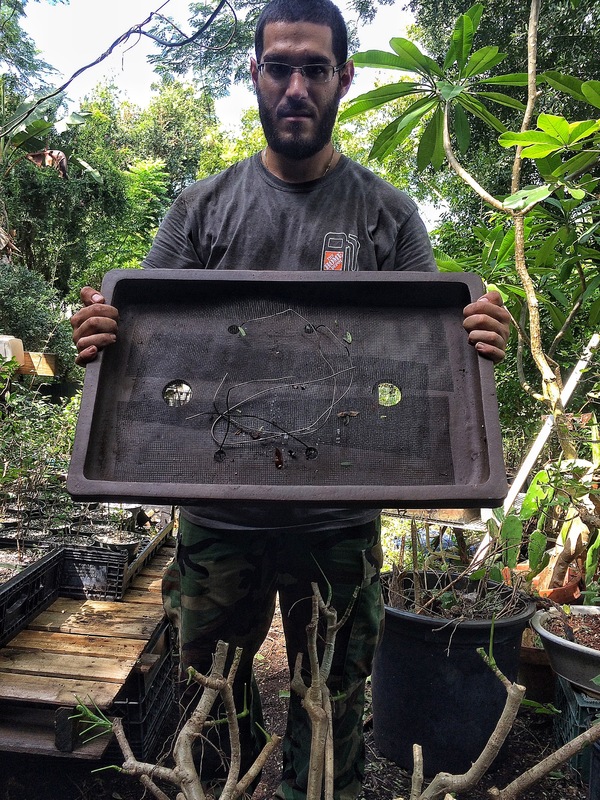 It is being kept in a greenhouse in full sun and it doesn’t get solder then 65 in it. Do you think the tree would handle the procedure at this time of year? I might just wait until spring. 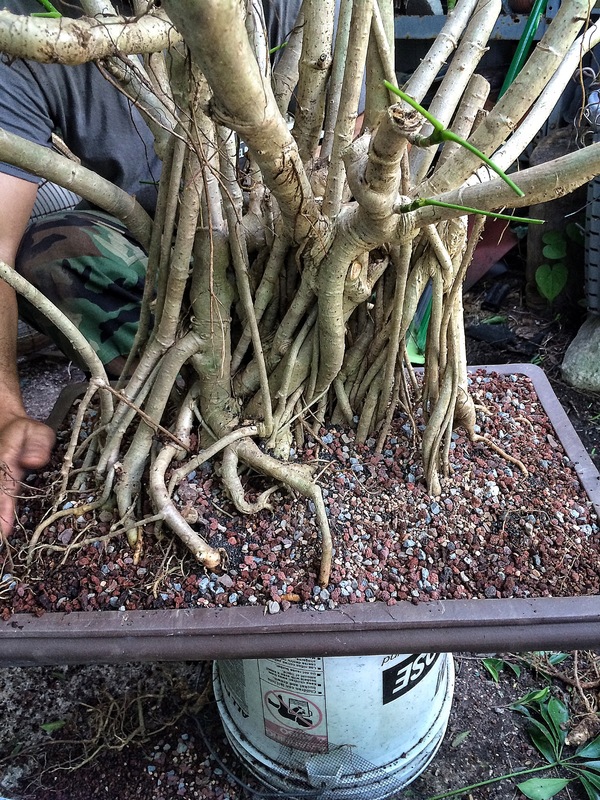 Being pot bound isn’t that bad of a problem for them but touching their roots when it’s cooler could be, 70 at night is a better temp. You wouldn’t think that 5 degrees would make a difference but it does. You might get away with cutting it back depending on its vigor and overall health. Thank you very much for the reply. I’ll just leave it for now and let it build up some vigor before doing work on it. any recommendations on pruning a root bound bald cypress purchased 5 yrs ago from a nursery and placed in what used to be my gold fish pond? Honestly I’m a bit nervous,so any advice would greatly be appreciated!